Our Team is made up of experienced Specialists who work together to provide our clients with the best possible Real Estate Service. We LISTEN, and we are DEDICATED to helping our Buyers find a home that Delights them, and our Sellers to get the most money NET from the sale of their home, in the shortest time possible, and with the fewest headaches. A compelling Vision: To be the real estate company of choice for a new generation of sales associates and real estate owners. and Shared Purpose, founded on the principles of trust and honesty, emphasizing the importance of having the integrity to do the right thing and always putting our client’s needs first. KELLER WILLIAMS® REALTY consists of people… and it is because of these dedicated people you can feel confident that all of your real estate needs will be handled in a most trustworthy, professional and efficient manner. 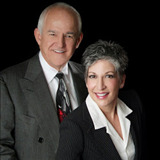 "As a Relocation Consultant it is always a pleasure being able to recommend Doc & Ellen Stephens to my clients who are selling their home. The feedback I get from from my clients is always outstanding, especially when they have interviewed multiple agents, the difference is then very clear."